NCEC is the chosen incident notification provider for many major global organisations – trusted to deliver a 24/7 immediate and professional response when every second counts. Our incident notification system enables your employees or other stakeholders at the scene of an incident to be connected to our team of specialist emergency responders. After gathering critical incident information, they relay it to the right people in your organisation. 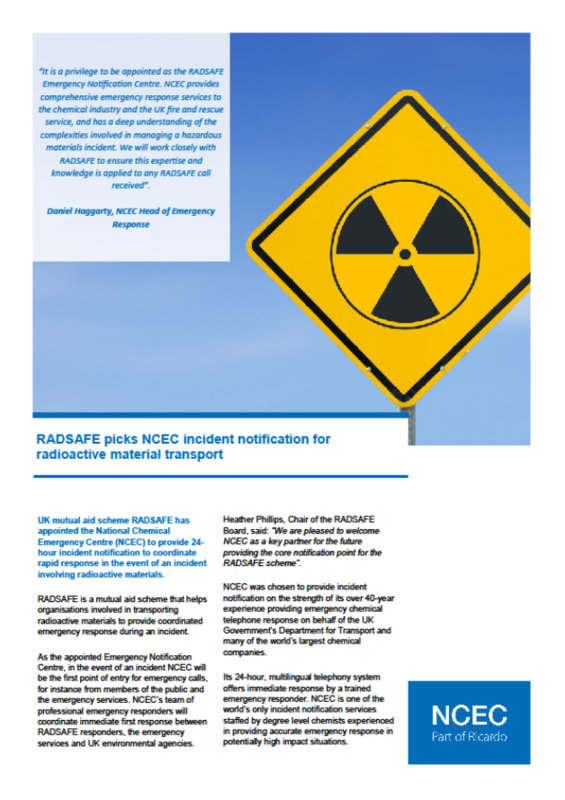 This aims to resolve incidents quickly, safely and with limited operational disruption. Having a robust, reliable and professional incident notification system for an organisation’s sites and supply chains is critical to protecting people, the environment, assets, reputation, maintaining business continuity and limiting the cost of an incident. 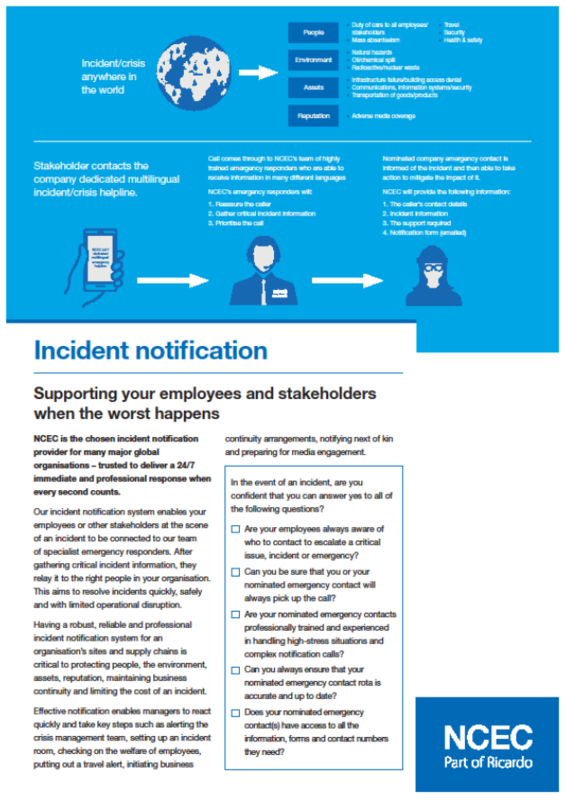 Effective notification enables managers to react quickly and take key steps such as alerting the crisis management team, setting up an incident room, checking on the welfare of employees, putting out a travel alert, initiating business continuity arrangements, notifying next of kin and preparing for media engagement. In the event of an incident, are you confident that you can answer yes to all of the following questions? Are your employees always aware of who to contact to escalate a critical issue, incident or emergency? Can you be sure that you or your nominated emergency contact will always pick up the call? Are your nominated emergency contacts professionally trained and experienced in handling high-stress situations and complex notification calls? 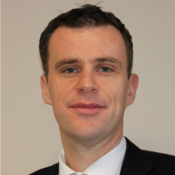 Can you always ensure that your nominated emergency contact rota is accurate and up to date? Does your nominated emergency contact(s) have access to all the information, forms and contact numbers they need? 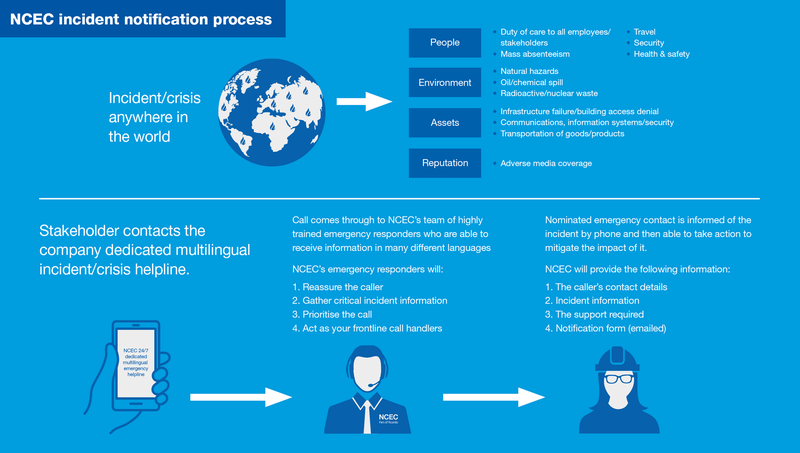 NCEC provides 24-hour multilingual incident notification – connecting employees and stakeholders at the scene of an incident to key people in your organisation quickly and efficiently. Multilingual, 24-hour service with the latest call-handling software – this helps to avoid calls for help going unanswered. Professionally trained degree-level emergency responders who are experienced in providing clear and concise support in complex or high-stress situations. They use their own initiative in an unscripted environment with your organisation’s bespoke procedures at their fingertips. A filter for technical and non-urgent enquiries, which means only the most important calls are passed on to your nominated emergency contact. A single, easily accessible location for all your forms and procedures. When an incident occurs, these details are quickly distributed to members of the team so each party can fulfil their role safely and effectively. Ongoing maintenance of the notification line, which means testing the nominated emergency contacts phone numbers on a regular basis.